My name is Michael Lehmann, and I am the Senior Product Support Specialist for our new registration platform, Payscape Registration! 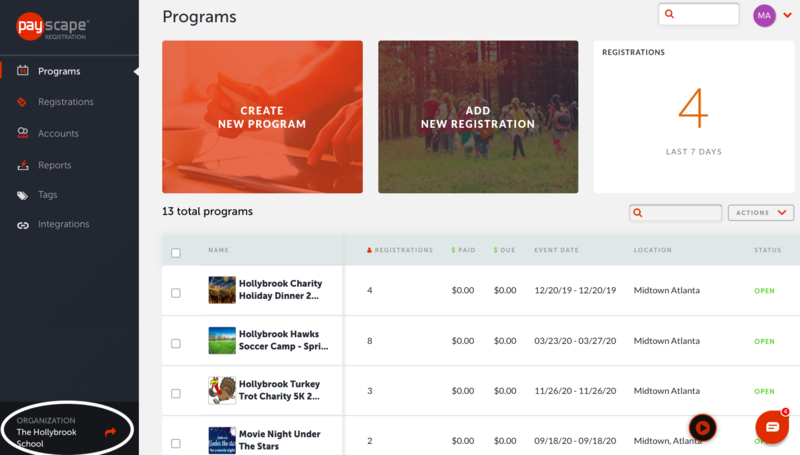 Our entire team is thrilled to offer schools, camps, auxiliary programs, and a variety of other organizations the most comprehensive and user-friendly registration software available today. I will be regularly highlighting some of the key features of our platform while sharing insider tips on how to best utilize your own account! This week, let’s take a deep dive into Payscape Registration’s organization profile dashboard, found in the bottom left corner of the menu, where customers can check out their account specifics and a whole lot more. First, the main profile tab enables you to create and edit key information, including your organization’s name and address, along with custom details surrounding your program landing page which can be accessed by clicking the orange arrow in the bottom left corner of the menu. From your unique URL to your banner and logo, there are many ways to custom-tailor your own landing page in just a few clicks. Next, you can view, add, and remove ‘teammates’ within your organization who have access to your account. A big feature update coming soon within Payscape Registration will be the ability to grant different permission and access levels, such as Super Admin and Collaborator, to teammates based on their role within your organization. It is now easier than ever before to organize and delegate your team’s tasks surrounding the registration process! In order to uphold our promise to remain 100% transparent with our customers, we created the ‘Subscriptions’ tab to help you and your organization keep track of your spending within Payscape Registration. Our simple tiered pricing model guarantees that you will always know which level you belong to and how much you can expect to pay every month. A fourth tab, ‘Files’, exists to provide you the option of uploading additional files and other documentation to your account based on your program needs and regulations. Keep registrants informed by giving them access to any necessary documents prior to your program’s start date! You can also view a log of every teammate’s activity in your account to track project completion and keep everyone on the same page within your organization. The more knowledge, the better! Are you convinced Payscape Registration will be a game changer for your organization? Start your free trial by clicking the button below and see for yourself why we are the leader in online registration software!